I picked this book up on a whim, immediately drawn in by "what could have been". I collect musical rarities, and the concept of this book was too tantalising to resist. I expected a heartbreaking read - all the treasure, all the unreleased music and to have it presented so clearly it feels so close you can practically hear it. However, as I got further and further into the book I actually felt glad that many of these didn't come to fruition. Whether it was a falling out, a poorly thought out idea or even a death, sometimes it takes something drastic to make you realise some things are best left shelved. Some of the albums sounded terrible, but curious all the same. With that though, there are some albums here I had no clue about and I actually felt a rock in my throat over the thought of never being able to hear them. The book itself is beautifully rendered with crystal clear album artwork (some genuine, some assumed) and a detail synopsis on where a band/artist were in their career when they thought of these lost albums. The book only really picked up steam for me as I entered into the 90s and 00s, hence the lower score. This isn't a fault with the book, more personal taste. Interesting as they were, the 60s and 70s felt laboured with the book only picking up steam when albums more relevant to me were discussed. As I said, not a fault with the book because it is great, it's more personal taste. I'm definitely the target audience for a book like this. 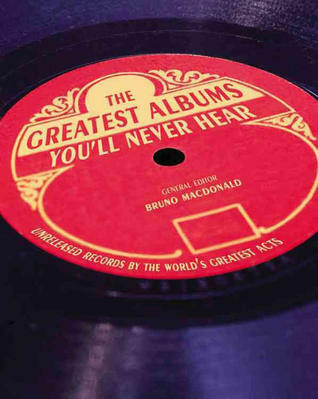 I love to hear about shelved albums — the friction between temperamental artists and the record industry. And while I did find it interesting, it was ultimately pretty light and, at times, corny. Also, some of the entries were really pushing the limits of what one should consider an unreleased album. Still, worth checking out if this is your thing. A really cool behind-the-scenes look at the music industry, this book explores how the creative process, business practices, interpersonal drama or just life can change the course of an artist's career. This book is all about how those factors led to those "lost" albums that you read about from time to time, but will likely never be able to hear. This book details a number of albums that were under development by various artists but never released.I found some of the details quite interesting, but I think you would have to be very interested in the artists described to really appreciate this book. This was a fun read, and I even learned a few things about projects I didn't know about. But the artwork seemed superfluous or bad, some of the selections were dubious, and this book seriously overused the word "mooted." An easy look through some of the most-bootlegged albums and others that never quite made it that far - many of them have now (eventually) made it out in some form or another. The title's therefore not quite right, but a good read for the most part. Decent read, but any revised editions should moot the word 'mooted,' which is incredibly overused in this book. I read it here more times than I've heard it aloud in my life. A good idea and it's fairly well executed but I'm deducting one star for some rather dubious entries.